Last week Mercedes-Benz unveiled the all-new 2014 Mercedes SLS AMG Black Series that made its online debut. Mercedes AMG says, “you can’t really improve a Mercedes, but you can make it different.” This new Black Series from AMG is not only different, but it’s the most extreme version of the SLS in company history. And the Black Series takes the excitement up a notch and it doesn’t get much better as this fifth Mercedes-AMG Black Series model was inspired by the SLS AMG GT3 race car and is the fastest version to date. 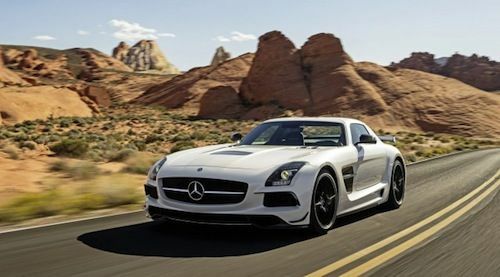 Fans of high-performance super sports cars are certainly fascinated with the new 2014 Mercedes-Benz SLS AMG Black Series, and this example is not black in color but is actually a brilliant white. The Black Series treatment is not about color, but is an extreme performance package that comes out of the AMG Performance Studio located in Affalterbach, Germany. There aren’t many production vehicles that can change the game like the new SLS Black Series. Originally an independent engineering firm specializing in performance improvements for Mercedes vehicles, Mercedes-AMG GmbH is now a wholly owned subsidiary of Daimler AG and builds every one of the ultra-performance Black Series cars. The AMG Performance Studio in Affalterbach is responsible for the high performance upgrades which make an AMG into an AMG Black Series model. The Black Series treatment is not only different, but exclusive and only available on 2 door AMG vehicles, and includes upgrades to the whole vehicle. It includes weight reduction, high-performance powertrains and exterior enhancements. The new SLS AMG isn’t the only Mercedes-Benz to get the Black Series treatment. In 2006, AMG unveiled it’s first Black Series, a SLK 55, and since then a number of other AMG models have undergone the AMG Performance Studio’s special upgrades including the CLK 63 AMG Black Series, SL 65 AMG Black Series, and C 63 AMG Black Series. Every AMG SLS 6.3-liter V8 engine is hand-built in the AMG factory in Affalterbach, Germany and each engine gets a black AMG engine badge bearing the signature of the engine builder, which is a hallmark of the Black Series models. It’s a comforting thought when you know the name of the guy who hand built your 622 horsepower powerplant. With each engine being given the personal attention of just one master mechanic, it’s no wonder the Black Series are so highly regarded among high-performance enthusiasts. Only one AMG master tech is responsible for everything from the instillation of the crankshaft, to adjusting the camshafts, to completing electrical wiring and even topping off the engine oil before it undergoes the first startup. Mercedes has raised the bar in the luxury/performance vehicle market and is the mark of the companies commitment to precision and performance. Mercedes says the 6.3-liter V8 gets the “ultimate final exam” and was tested in the harshest environments before it ever gets dropped into the AMG SLS. It went through high-altitude trials in Denver, Colorado, Lesotho, South Africa, and Granada , Spain. It underwent heat trials in Death Valley, California, Upington, South Africa, and tests tracks in Phoenix, Arizona and Idiada, Spain. It was subjected to cold trials in Arctic Falls Sweden, and withstood full-load conditions on the Nurburgring north loop. Every AMG engine is required to perform like, well, an AMG. The images that were released last week were inspirational to say the least, and the new video released by Mercedes-AMG GmbH tells even more of the story that words just can’t say. Even though we can’t hear the hand-built 622 horsepower AMG 6.3-liter V8 engine that generates enough power to blow your socks off, you can almost hear it as the supercar propels itself down the desert road in the video. Sales of the new 2014 Mercedes-Benz SLS AMG Black Series commence next summer. Mercedes-AMG GmbH has not announced pricing for the all-new supercar but should be available closer to its debut at the 2012 Los Angeles Auto Show. Check out the video below and get a taste of what makes the the Black Series so special.